We talk a lot about poorly-supported product categories around here, but the insulated tumbler market is definitely not one of them. 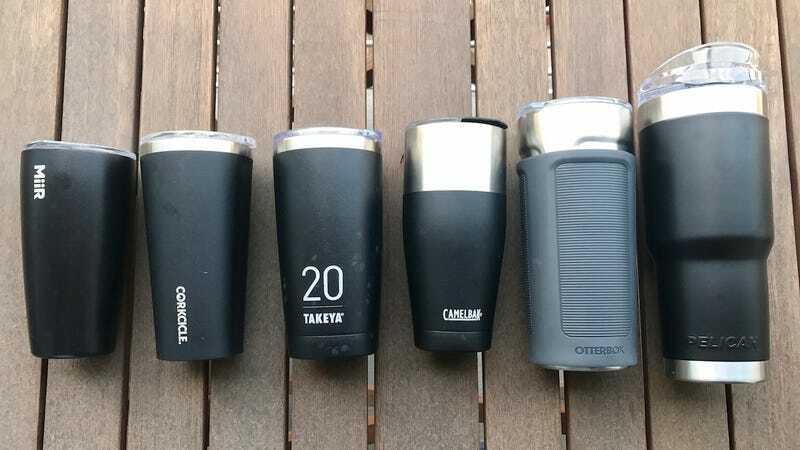 The sheer number of entries into the insulated drinking vessel space was a running joke at Outdoor Retailer this year, so today we’re going to try to make sense of your options. As with travel mugs and coolers, while you can certainly rank products by the length of time they can keep ice frozen or drinks hot, every option likely offers more performance than 99% of people need. With that in mind, we’ll be putting the experience of using a product and its unique feature set ahead of how many years it keeps beer cold. We’ll cut to the chase, Corkcicle’s Waterman Tumblers are our top choice for everyday use. They also make our favorite koozie. Otterbox is not playing around, with extremely strong entries into the tumbler, growler, and cooler spaces, and you can expect coverage from us of the latter two shortly. Corkcicle is our daily driver, but Otterbox is what we want in the wild. Otterbox went all in on modularity with their uniVERSE phone case system, and those learnings are carried over here. Accessories turn the Elevation Tumbler into a French press, cocktail shaker, thermos, tea steeper, and fruit infuser. What’s different: Copper lining, modular lids eliminate the need for other products. Accessories: French press lid, flavor infuser lid, shaker lid, thermal lid, sleeve. YETI: We can’t talk about insulation without acknowledging the elephant YETI in the room. We’re working on getting YETI’s lineup in hand to put through the paces, and we’re intrigued by the new MagSlider lids on their tumblers, and we like that they offer straw caps and lids, but as of now Otterbox has them beat on the accessories front. Pelican: Like Otterbox, Pelican isn’t sitting back while YETI takes over the world. 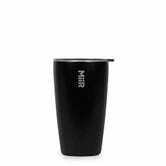 Their tumblers look great and feature copper lining, powder coatings, and closing lids. RTIC: While Pelican and Otterbox are aiming to out-premium YETI, RTIC is shooting to offer similar performance at bargain basement prices, and they even make a 40 oz. option. Their hard cooler and soft cooler took first and second place respectively in your voting, while their tumblers are the most popular we’ve ever listed. MiiR: MiiR makes our favorite camp cups and growlers, and their tumblers are among the thinnest and lightest we’ve used. They should be your go-to for smaller sizes, with 6, 8, and 12 oz. offerings. Takeya: Takeya’s Cold Brew Coffee Maker is one of the most popular products we’ve ever listed on Kinja Deals, and if you want a 40 oz. bottle that isn’t a nightmare to drink out of, theirs is the only good game in town. Their updated Actives line features the welcome addition of a lid that actually seals, not just closes, but the thickness of their tumblers still feels clunky compared to the same sizes from the competitive set. Hydro Flask: Not that we hadn’t already used most of the products in Hydro Flask’s arsenal, but their insulated vessels were as ubiquitous as red Solo cups at our recent weekend at The Outpost. Hydro Flask certainly wins on color and customization options, and we’re looking forward to checking out their new wine collection. CamelBak: The CamelBak Kickbak tapers to fit both your hand and a cupholder, and has a dual-opening lid to cover big gulps of water or small sips of coffee. Mizu: Mizu’s sole insulated tumbler is 21 oz. and features copper lining. 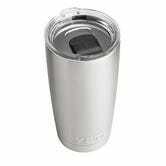 Contigo: Contigo does not currently offer a non-plastic tumbler with a lid. Still thirsty? Needless to say we expect this list to get updated on the regular. Tell us about your favorite tumbler in the comments.